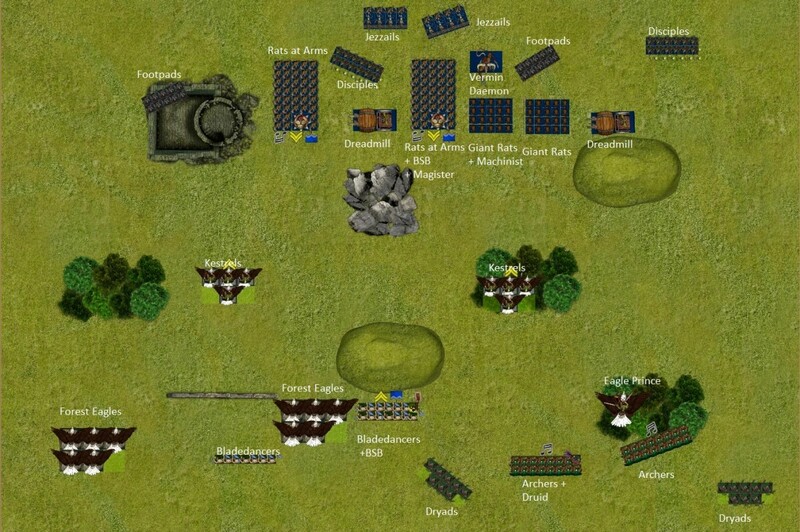 MSU battle reports, as first seen in TWF. So we’re now in the third game of the day, and now the weariness is setting in: we’ve been awake since 5am, who said that tournaments are not an endurance sport! What made things easier was the news that we’d get to play against our friends and neighbors from Luxembourg! 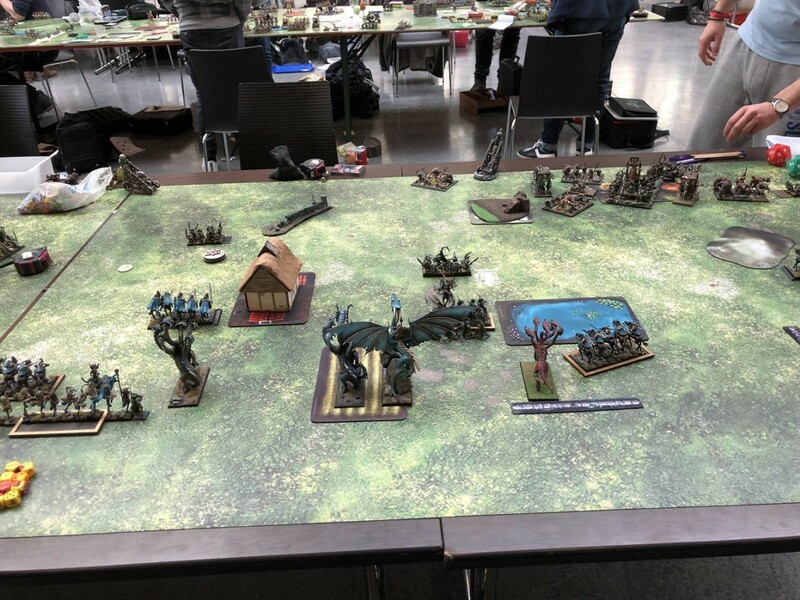 We’ve met them a couple of times now on the battlefield, but we often travel to the same tournaments and it’s always a pleasure to get together and share a drink, exchanging war stories. 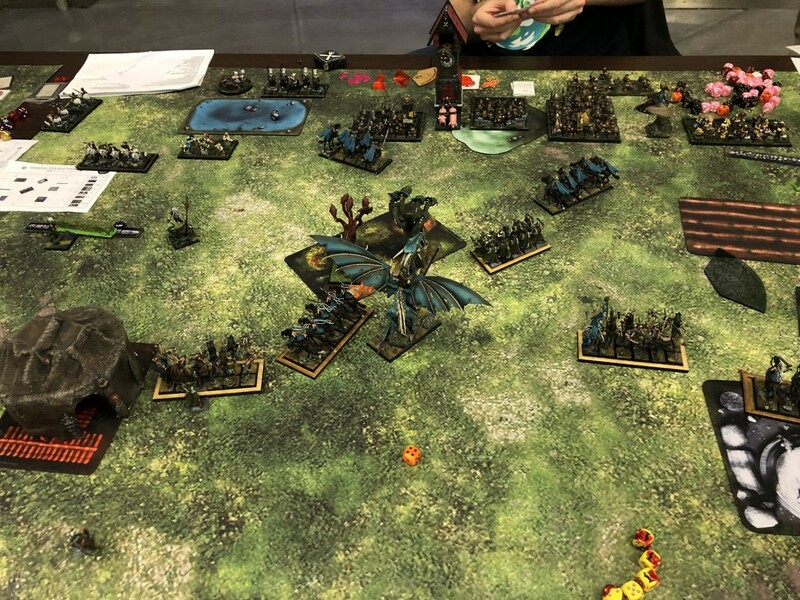 They had lined up Vampires, Vermin Swarm, Sylvan Elves and Daemon Legions, and I got one of the more favorable matchups against @zlatanlux ‘s vampires. 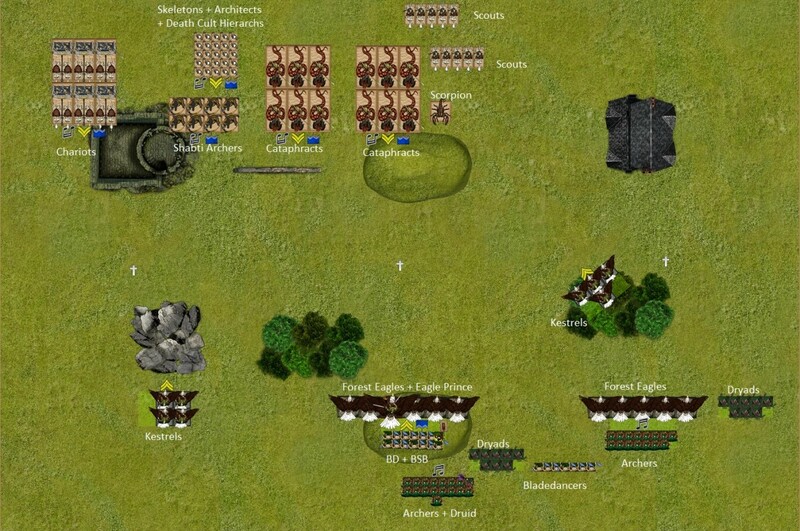 This time the scenario was Hold the Ground, and the deployment type was to be Frontline Clash once more. 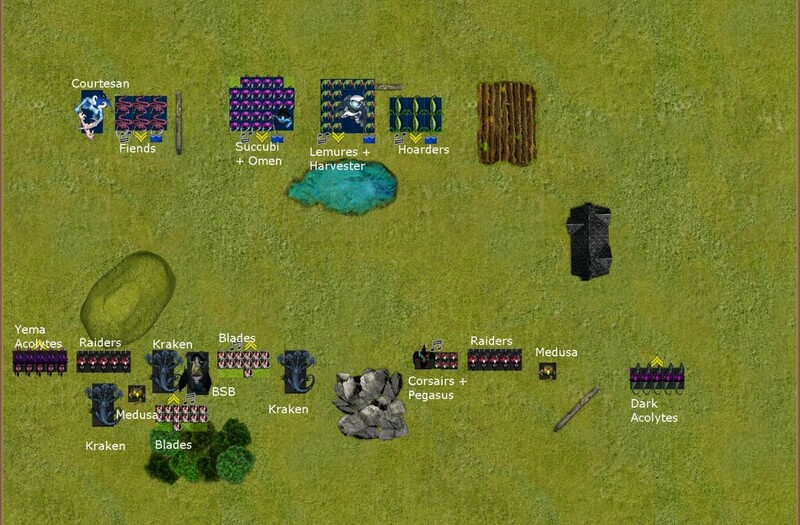 So all in all a relatively compact vampire force with a good amount of redirectors, an unkillable anvil in the form of 9 Ghasts with 4++ regeneration save, and a magic phase with enough raising ability to ensure that both skeleton units would be 60-strong in no time! 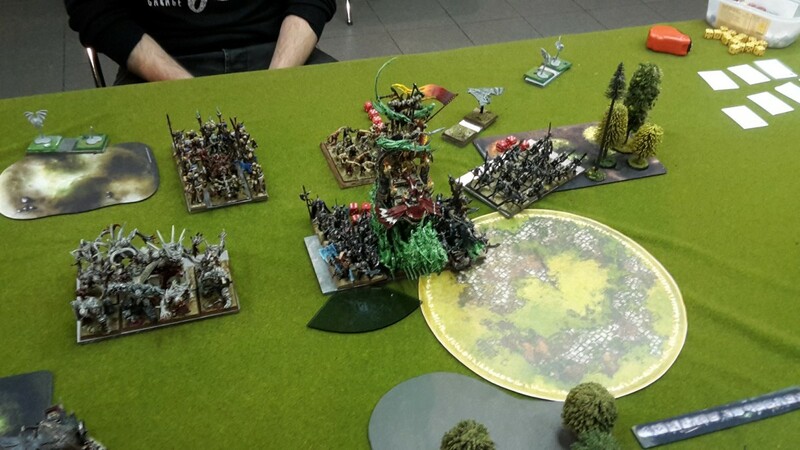 When doing the estimation for this match I hadn’t taken into account the secondary objective: hold the ground is one of the easiest ones for vampires due to their big, immoveable units. 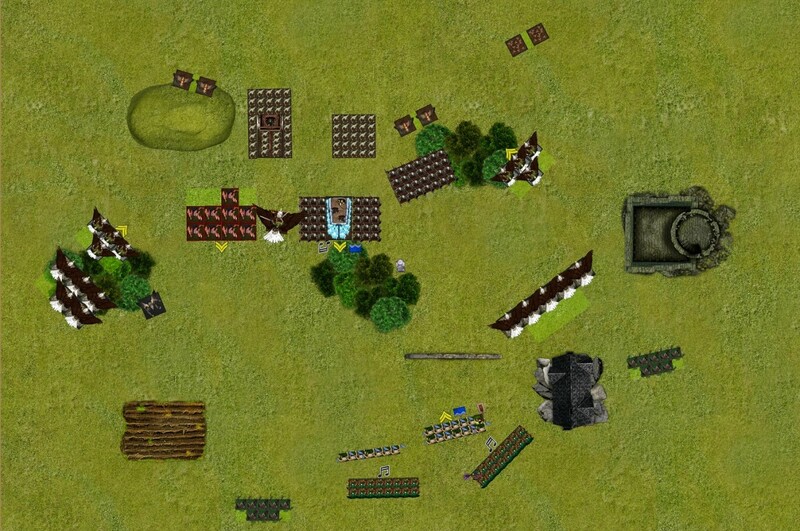 So I had to get creative about how to approach this game! 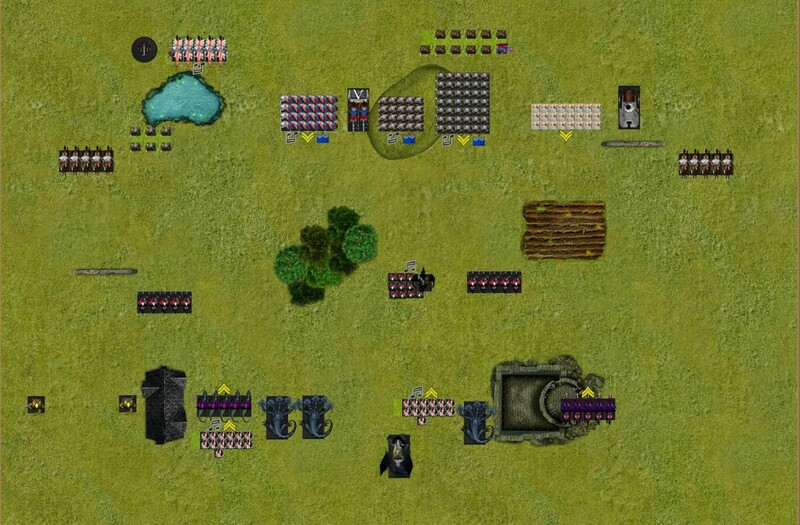 One thing was for certain: engaging the big units to the front was a very bad idea! 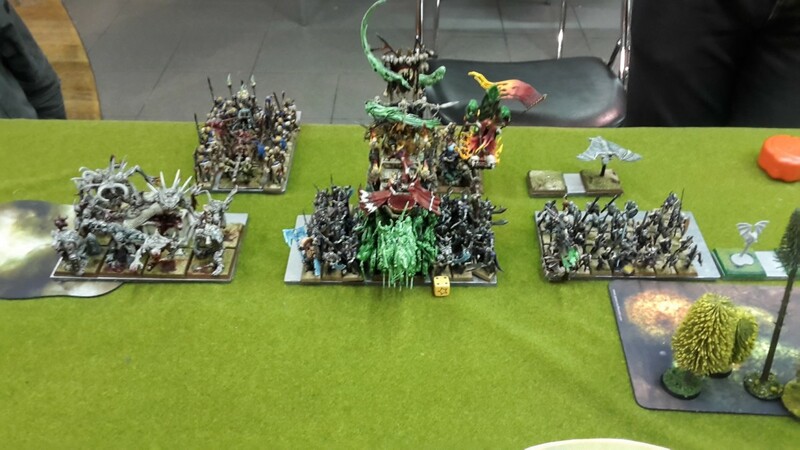 For magic,I got Forest Embrace, Beast Awakens, Insect Swarm, Totemic Summon and Break the Spirit. 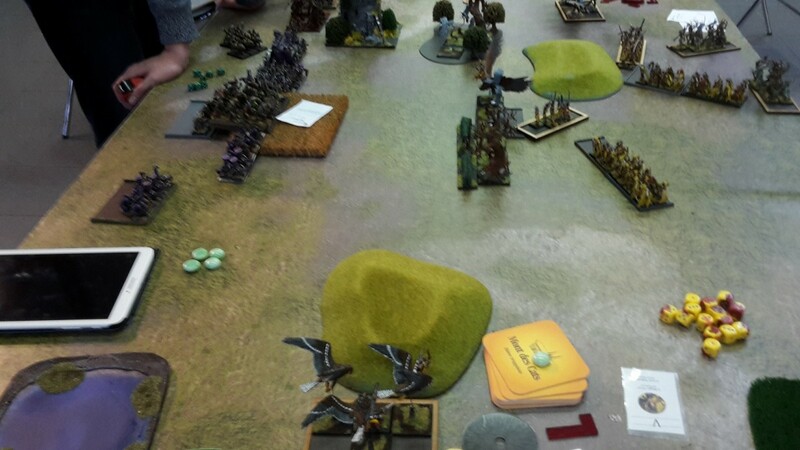 My opponent got three times the hereditary spell, then went for Raven’sWing, Glory of Gold, Spectral Blades, Danse Macabre and Touch of the Reaper for his other spells. 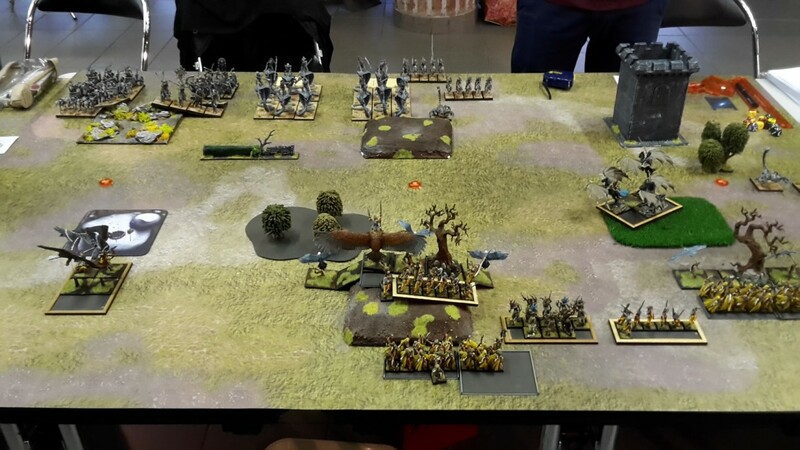 My opponent chose sides, and I then gave him the first drop: against vampires playing second is usually a good idea, especially when playing the central objective. 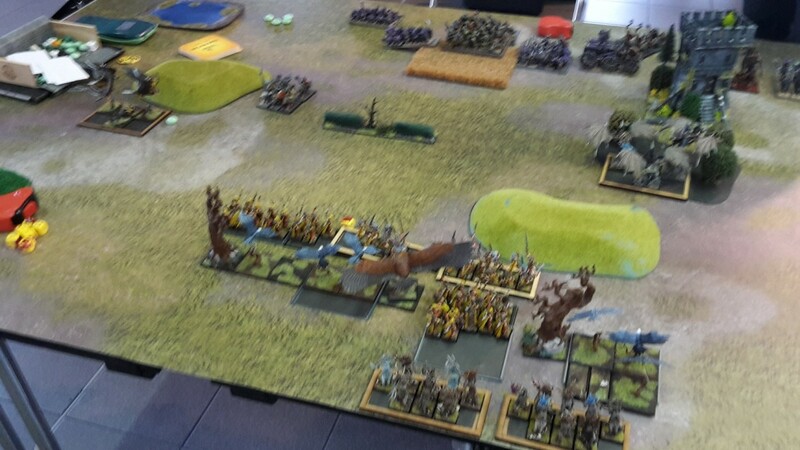 So I was kind of relieved when he dropped his entire army to get the first turn. 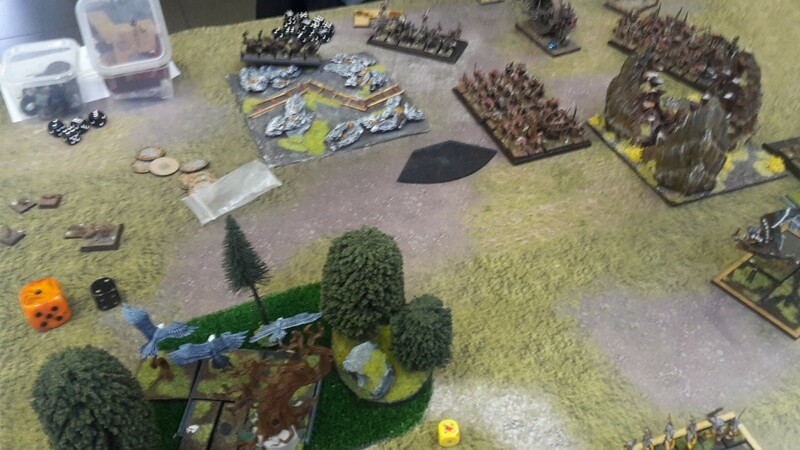 He went for a central deployment, weighing one flank with the Ghasts and the Varkolak. 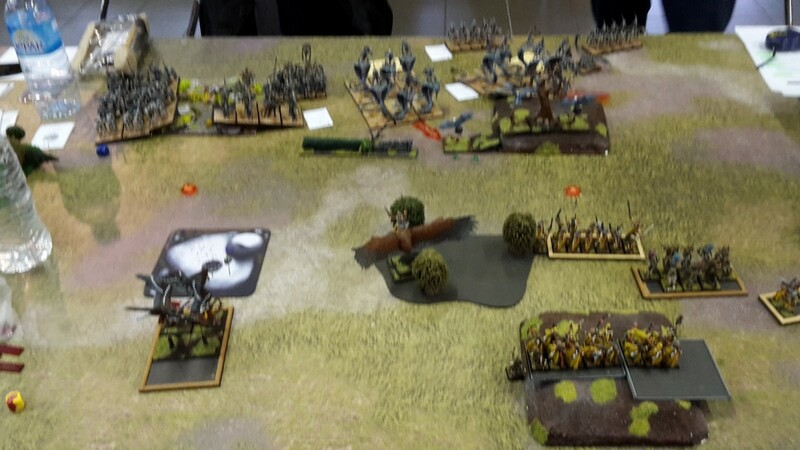 I responded by pushing both kestrels and the two eagle units up the flanks, keeping only the bladedancers in the middle, with the scorers a good distance away from any undead unit but still in a position where they’d be able to start contesting the objective from turn 3 onwards. 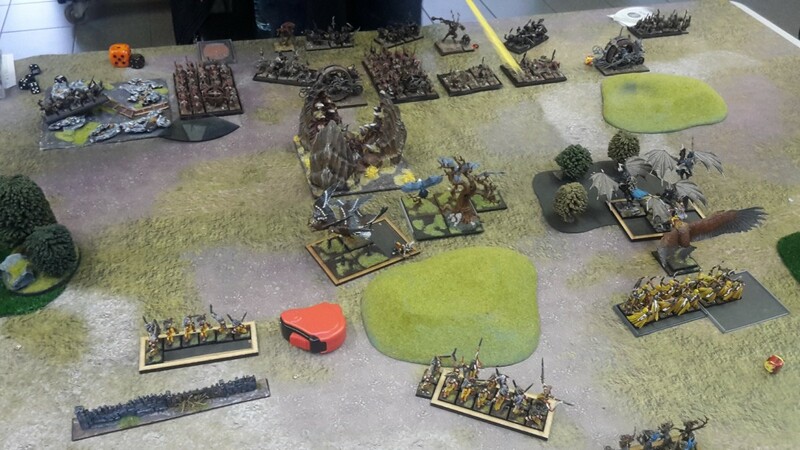 As is customary for the vampires, the entire army surged forward, the varkolak making use of his movement + vanguard to come close to my lines. In the magic phase I was reminded how difficult it is to contain a magic phase when your opponent channels 5 veil tokens per turn! 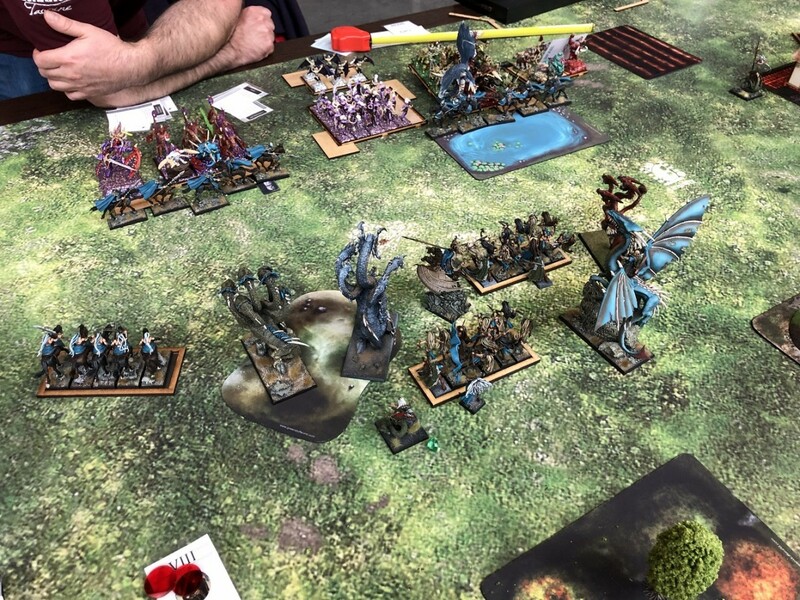 My priority here was dispelling the movement spells, meaning that the hereditary spell was cast thrice in the 6” aura version: a good chunk of skeletons were raised, bringing the units to around 45-strong each. 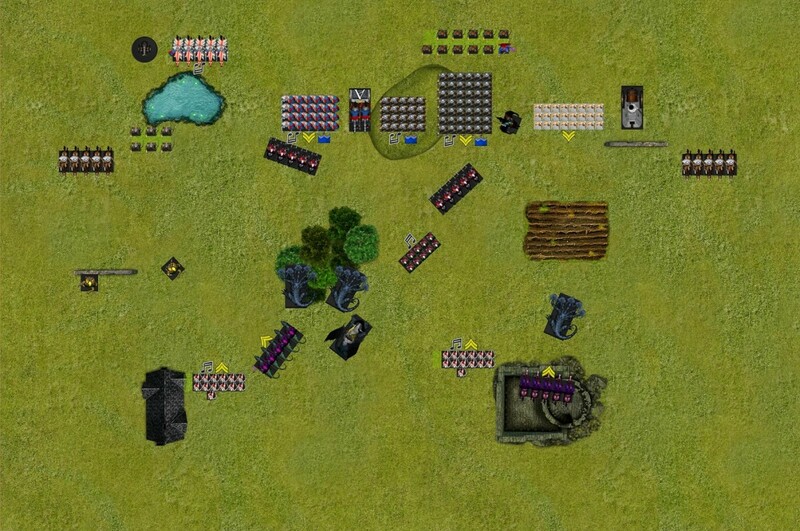 While I knew I’d have to try and deal with the magic in an aggressive manner relatively fast, the previous magic phase made it clear that I should really make it a priority: all of the flying units moved up both flanks, within charge range ofthe zombie bunkers. 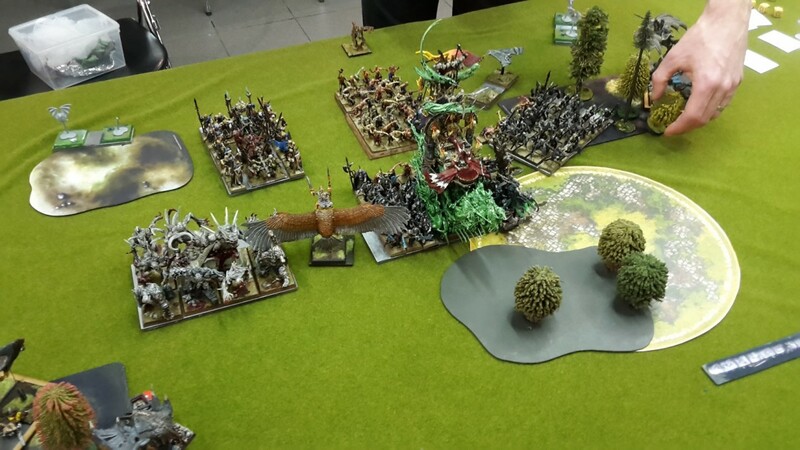 The Eagle Prince spotted a 4” gap between the Ghasts and the big skeleton block, and landed there, with the necromancers’ unit in his sights. 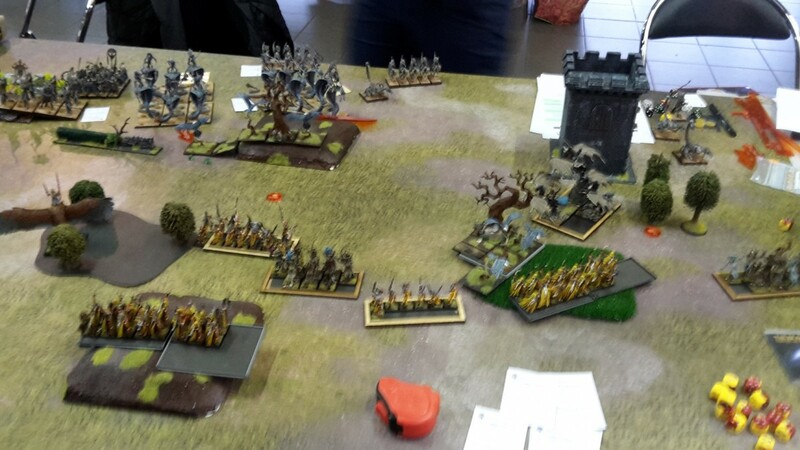 The slower parts of the army maneuvered, trying to keep a healthy distance from the Varkolak. The magic phase started with a Treesinging that put a forest right in front of the big skeleton block. The Insect Swarm was then dispelled, meaning that the Totemic Beast could be cast! 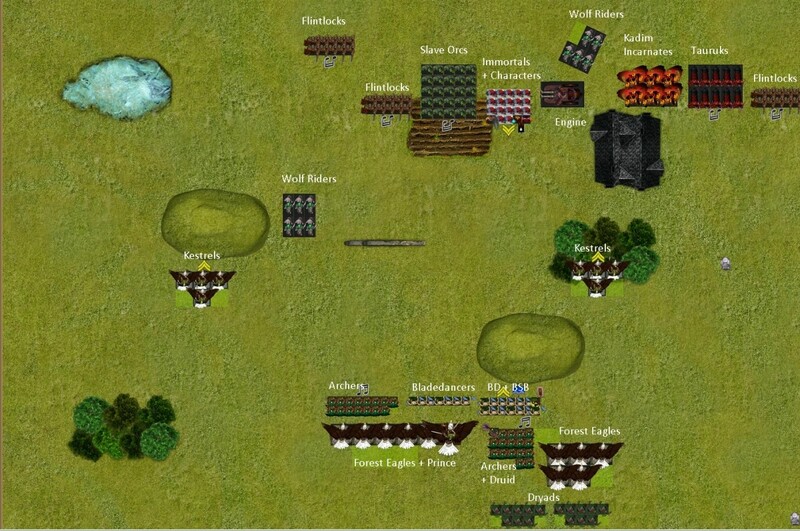 Shooting was aimed at the Varkolak, putting three wounds on the beast despite its regeneration. 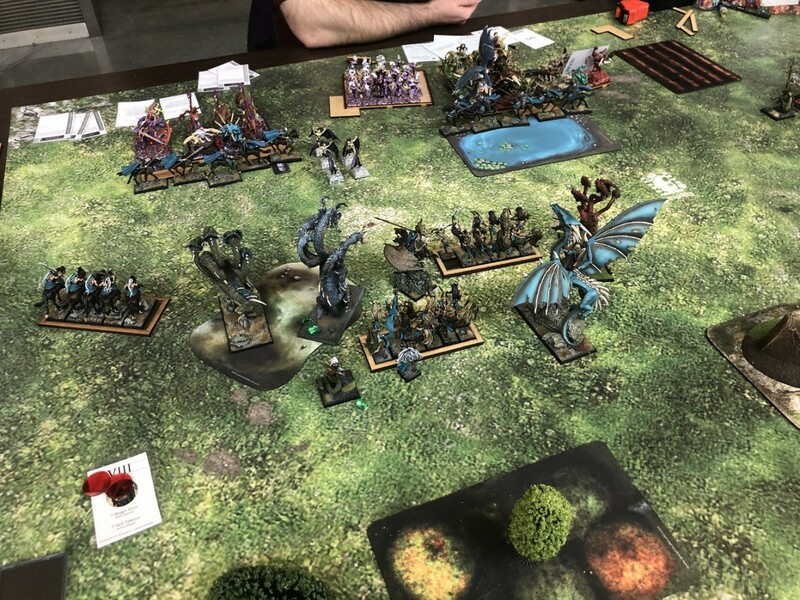 With a single wound remaining, the Varkolak didn’t dare declare a charge; the Cadaver Wagon solo-charged into the Eagle Prince, though, threatening to pin him in place long enough for the Ghasts and the Varkolak to come to the rescue. 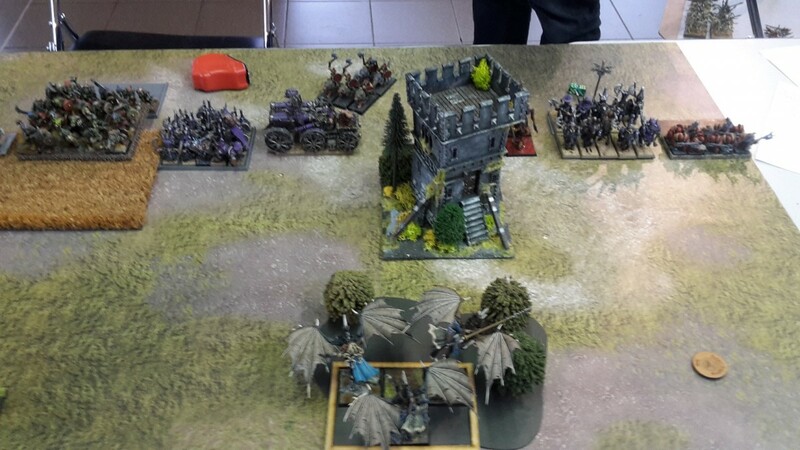 Both of the aforementioned vampire elites maneuvered to get clear charge lanes on my prince in the following turn. 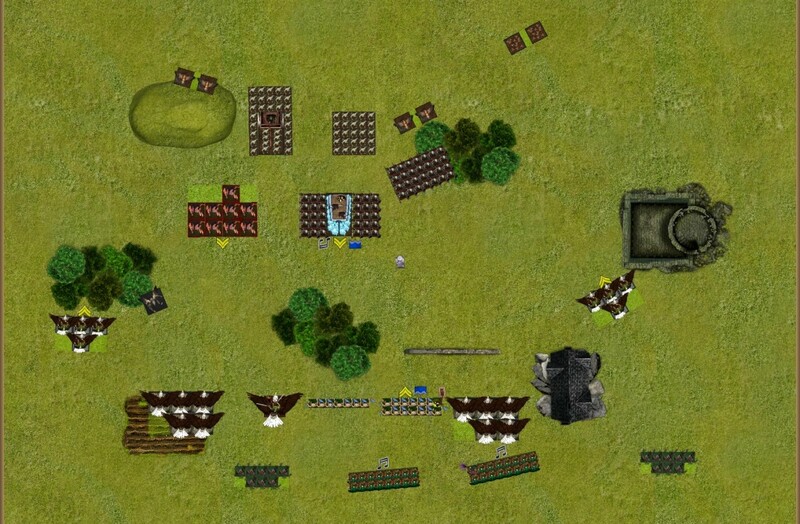 The big skeleton block moved up, and the other units consolidated their positions a bit, in an attempt to contain the flying threat. 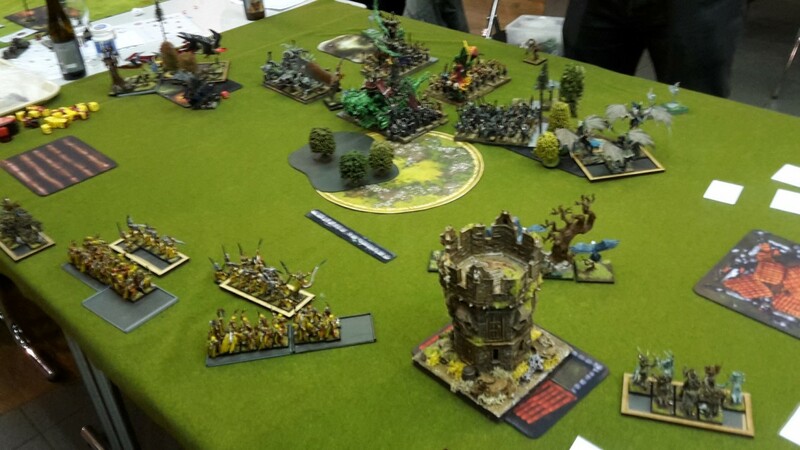 For the second round of the tournament we were to face the other half of the team Belgium, who had performed admirably in the first round! 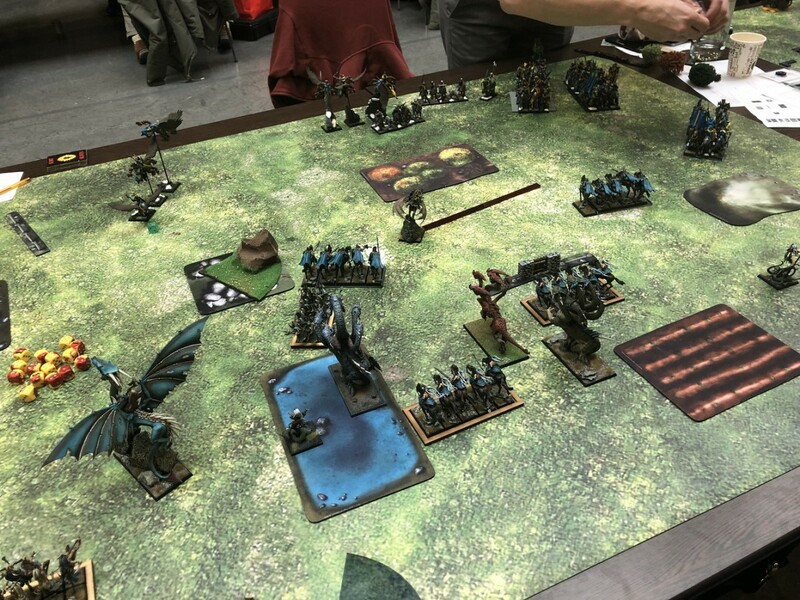 While it was a bit sad to have to play against our frequent sparring partners, this has proven to be inevitable for the past three years: their results are usually as good as ours, so we end up having a civil war of sorts! 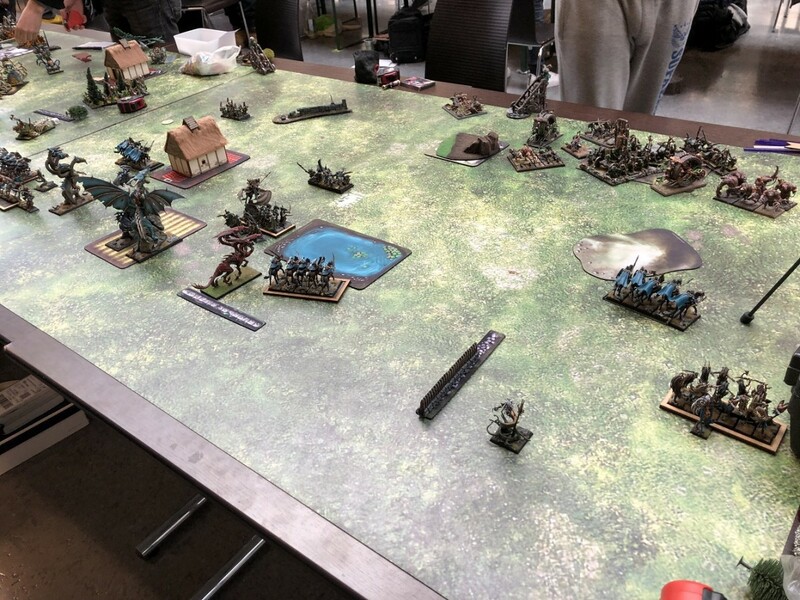 The Rieurs Sangliers (laughing boars in French) had lined up EoS, VC, KoE and Vermin Swarm, and it was the latter that I would have to play against. 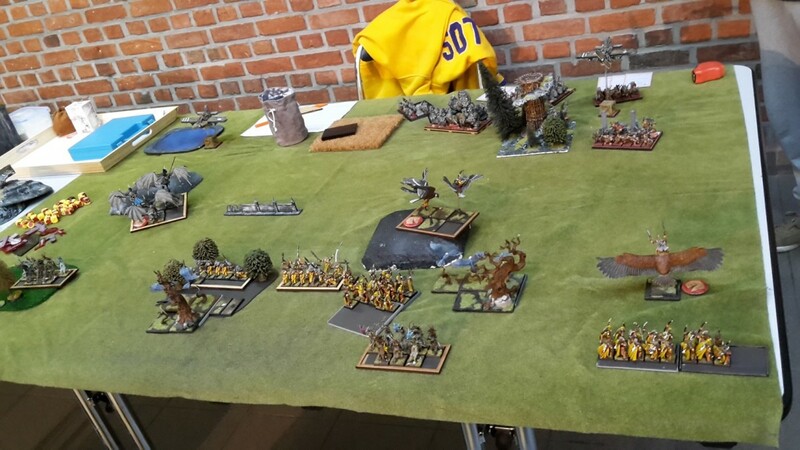 Their commanding general was @valmir , whom you may remember from an earlier battlereport against the Dread Elves: as is customary, he had stomped all over my elves with the help of his Dreadmills and Vermin Daemon. 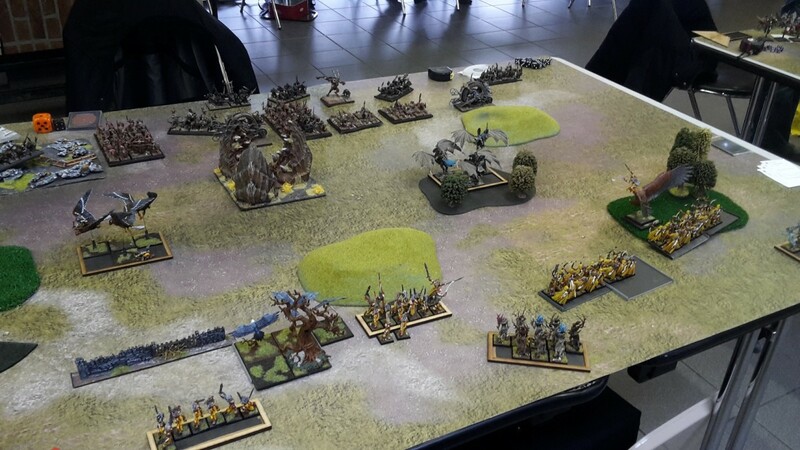 This was a game that I wasn’t too optimistic about, as I feel that Vermin often have all the tools at their disposal to deal with all kinds of elves. However, team strategy required me to get this relatively bad matchup so as for others to get more favorable ones. 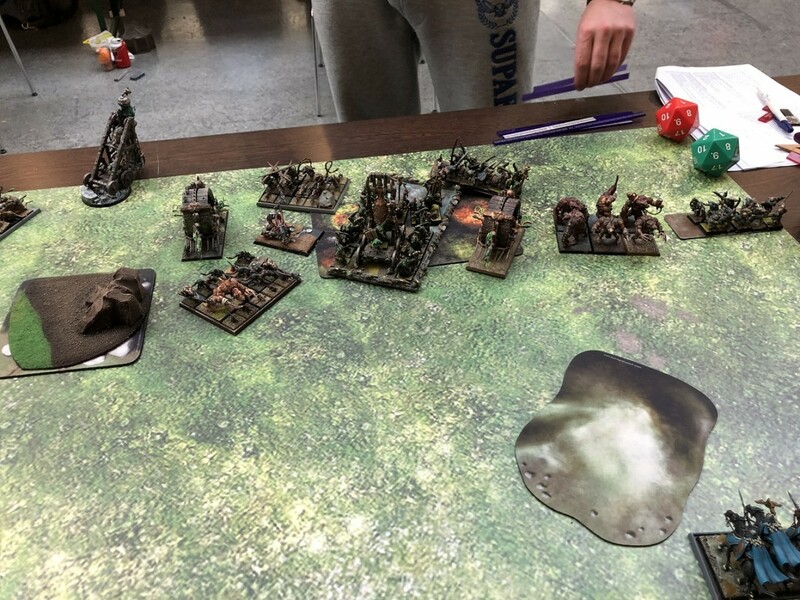 So a lot of the usual suspects: Vermin Daemon, Dreadmills, Plague Disciples, but also his personal touch of the meat grinder R@A blocks and the Machinist for unlimited breath weapon shenanigans. 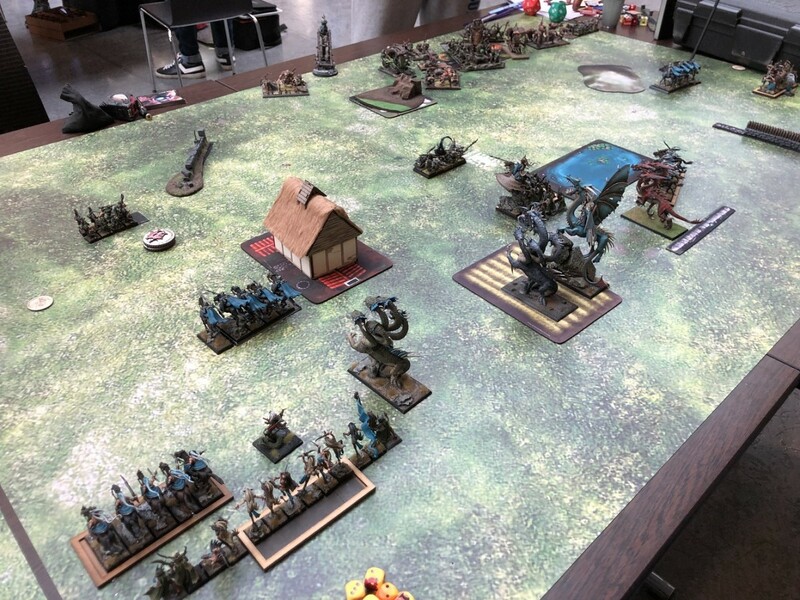 We would be playing Breakthrough, and the deployment type was Marching Columns: this last piece of news was particularly good, since it meant that I might be able to put pressure on the parts of the vermin swarm army that would be left without support! 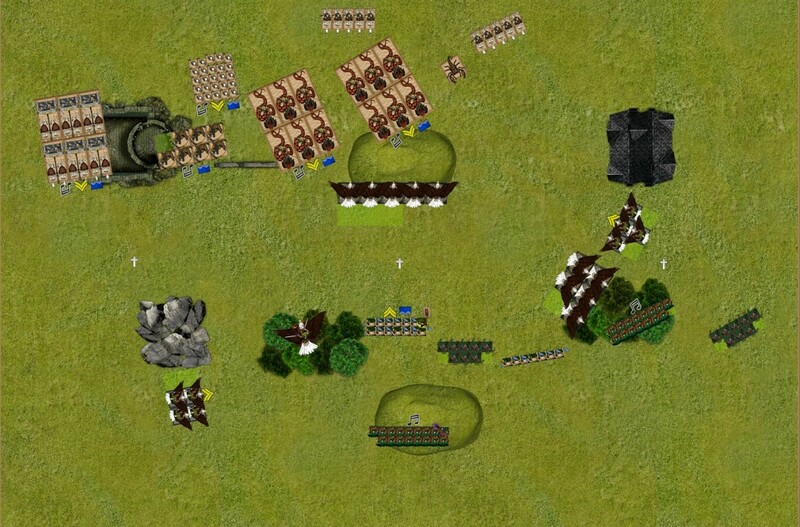 Wealternated deployment for a while, since getting the right matchups was way more important than getting the first turn. 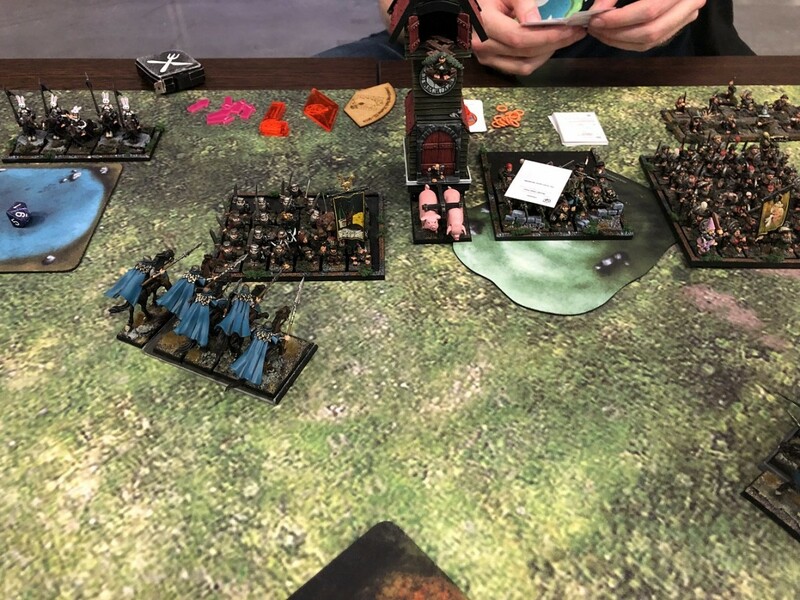 Unfortunately, the rats had far more deployment drops, so once I had a vague idea of where the scoring units would be going I deployed my remaining regiments and got first turn. 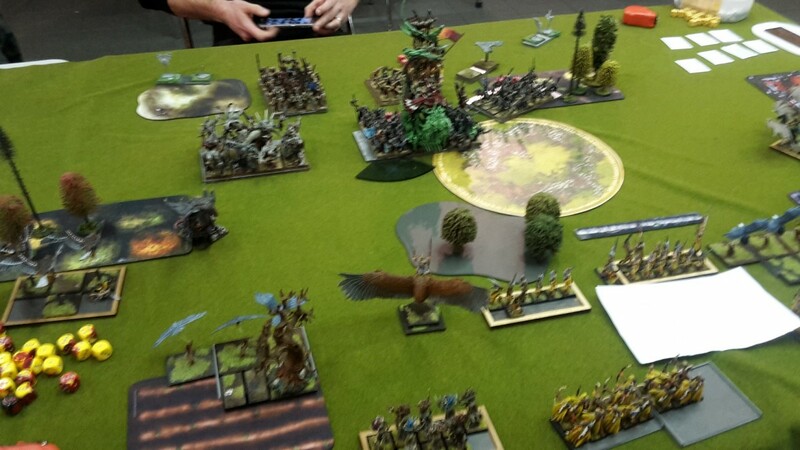 For spells I selected Forest Embrace, BeastAwakens, Swarm of Insects, Chilling Howl and Totemic Summon. Valmir took Handof Heaven and Smite the Unbeliever for his Magister and Unerring Strike, Fate’s Judgment, Awakened Swarm, Know thy Enemy and The Stars Align for his Vermin Daemon. 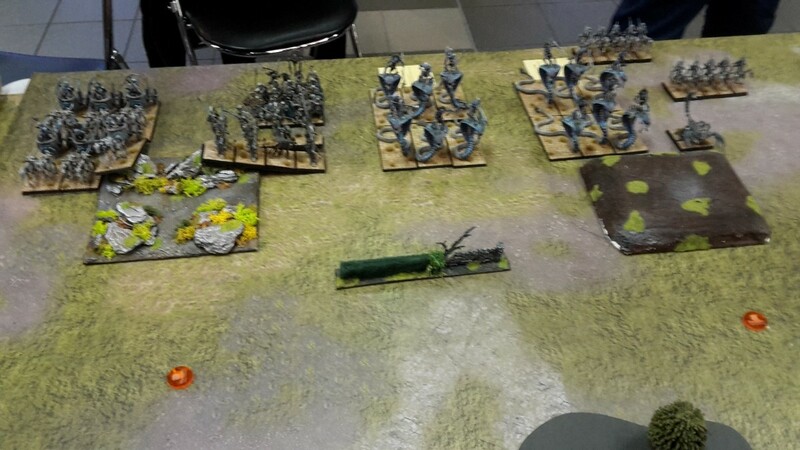 Going into the game, I decided to play for the scenario by using my fast units to prevent the enemy scorers from penetrating into my deployment zone, creating pressure all over the board and then finally cheekily moving a unit of dryads inside the vermin swarm zone. 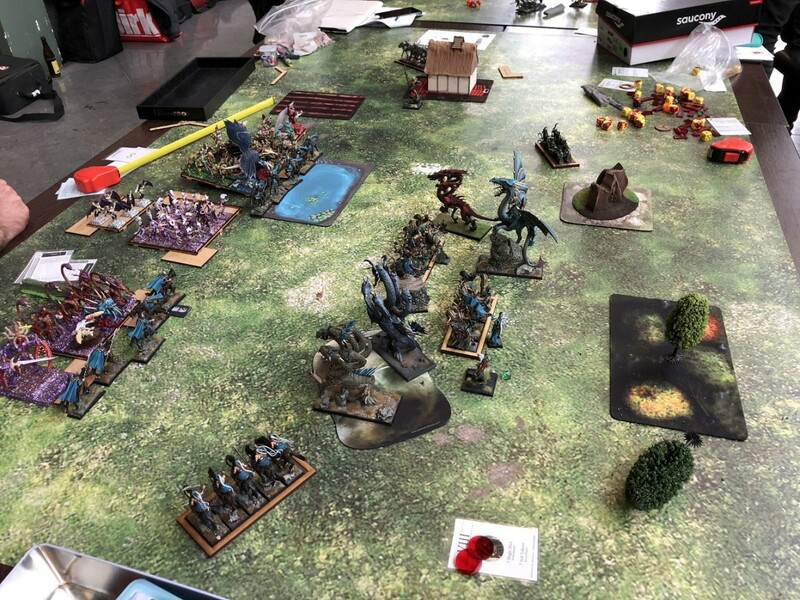 Valmir countered this quite nicely by employing his dreadmills and disciples near his flanks, trying to funnel my forces to the center where his combat blocks and the Vermin Daemon were waiting. 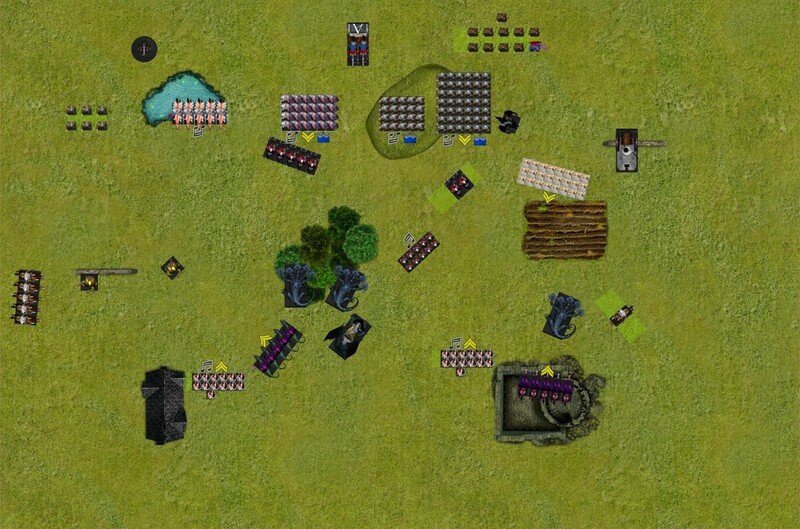 All of the flyers moved up behind terrain, within charge range of the scorers and keeping an eye out for the Dreadmills: if they peeked from out of cover I’d be able to charge them I return, hopefully ridding myself of that menace and gaining some more maneuver space. 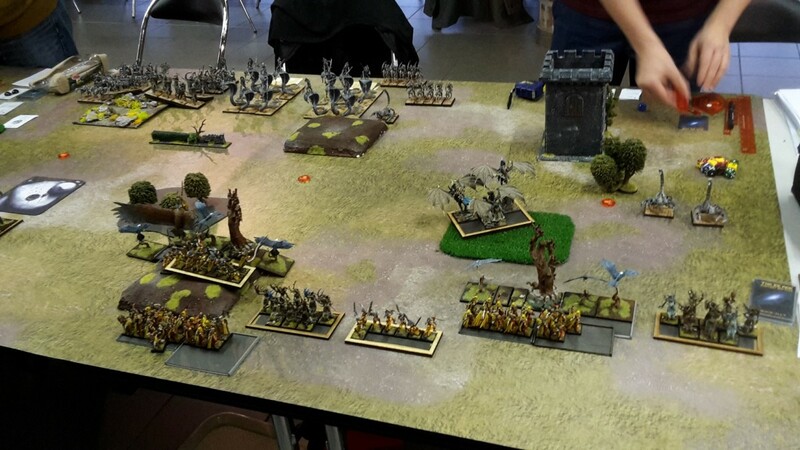 The archers stayed safely in the back, still within range for some light shooting. 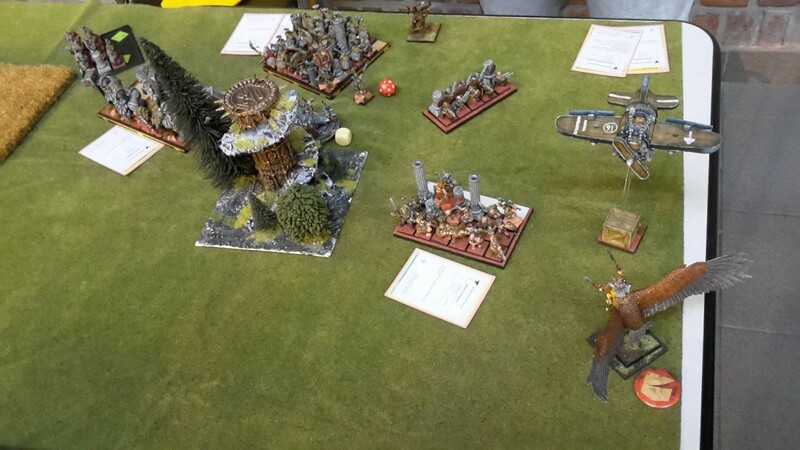 In the magic phase I was able to push through a Totemic Summon, and the beast appeared right next to the Jezzails! Its breath weapon only dealt a single wounds to the vermin shooters, though. 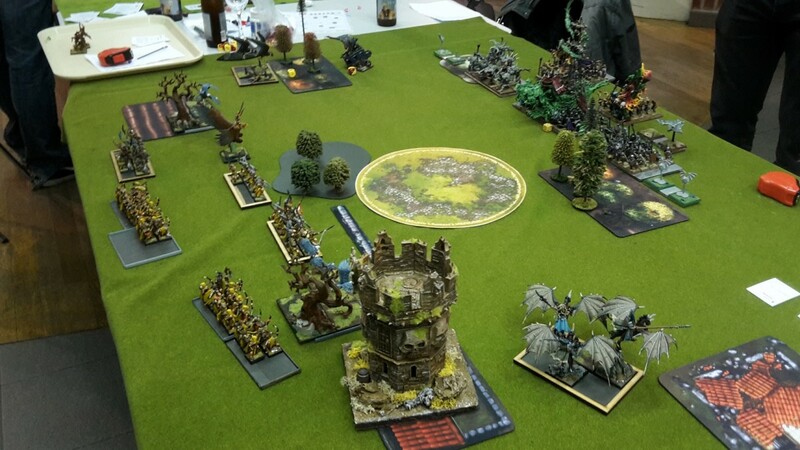 The archers took pot shots at the Vermin Daemon and managed to inflict a wound! 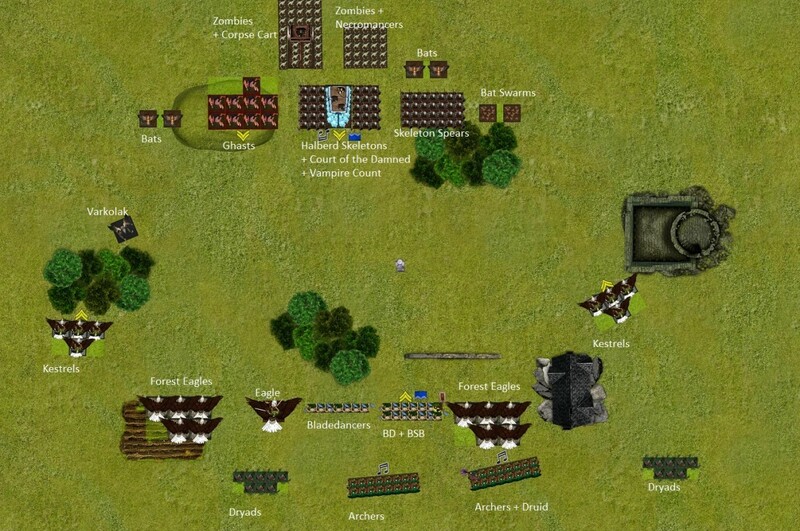 The vermin chose to go on the offensive: one unit of Giant Rats charged into the middle Forest Eagles. 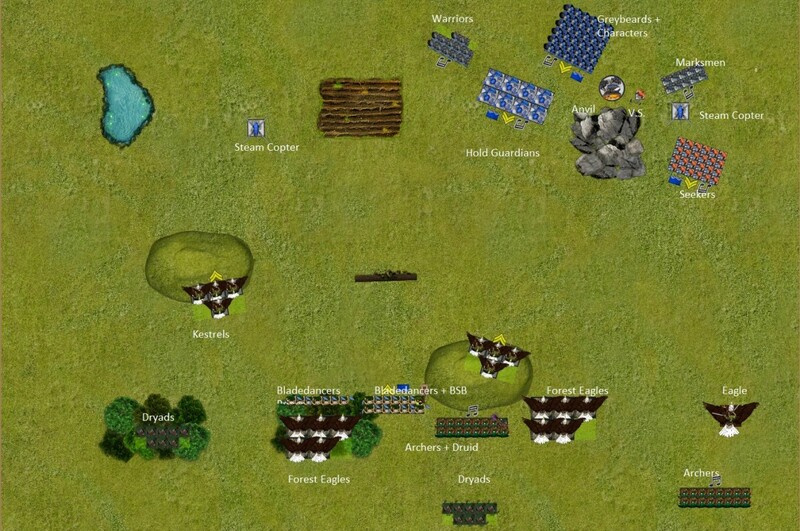 The second unit with the machinist moved up towards the right kestrels, within range for the machinist’s breath. 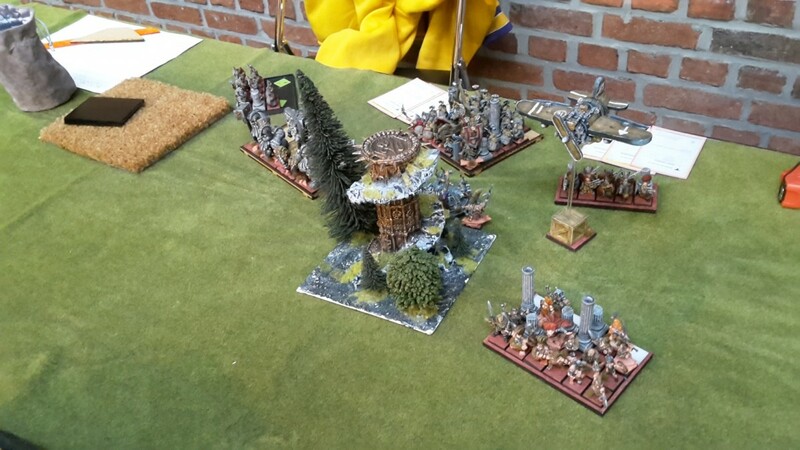 Both units of Rats-at-arms moved up a bit, and the left Dreadmill had to backpedal to deal with the totemic summon. 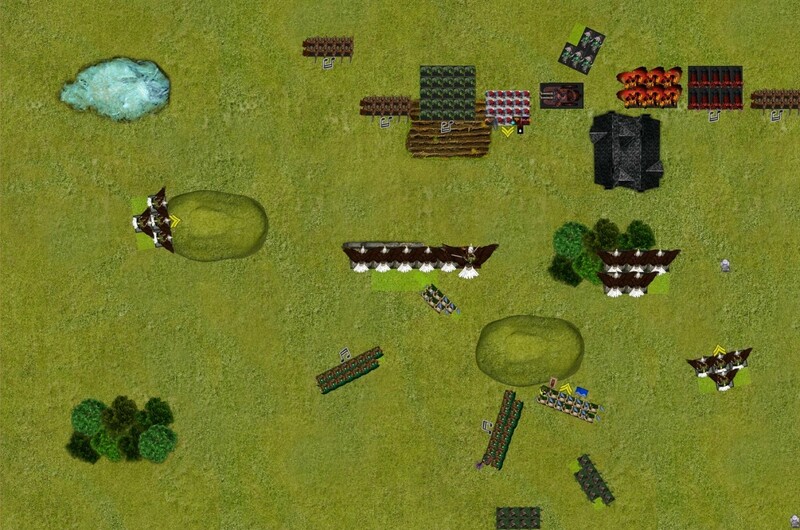 The flank forces shuffled to create bigger threat zones and prevent my birds from flying over their lines. In magic the Hand of Heaven was dispelled, allowing the Magister to curse the Forest Eagles in combat with Smite the Unbeliever, giving them -1 Strength. 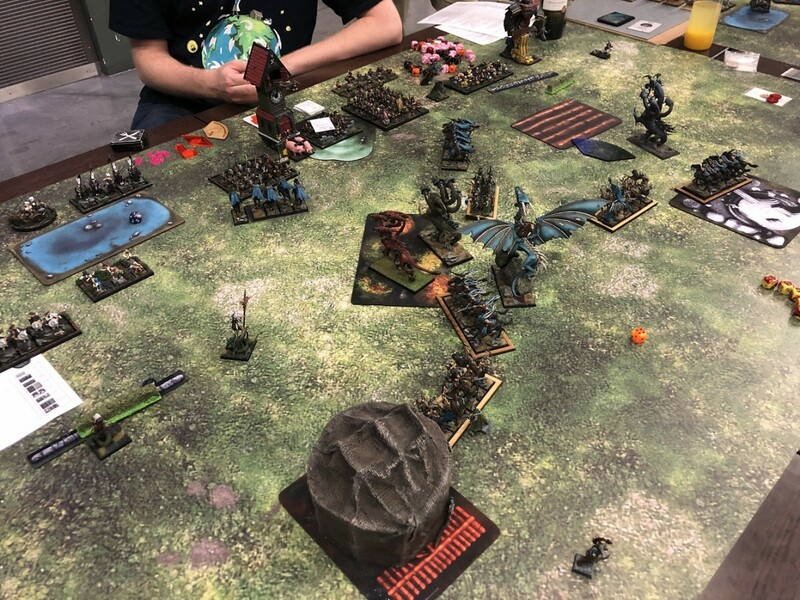 The worst part of shooting was avoided thanks to a combination of Hard Target and Cover penalties, and the rest underperformed: the Dreadmill failed to wound the Totemic Beast, the Jezzails wounded my Prince once and the Machinist only put awound on the kestrels with his breathweapon. 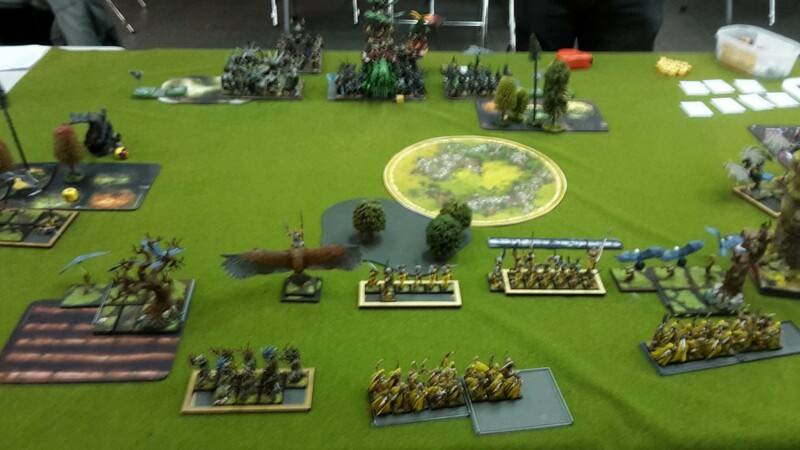 Combat saw the eagles and rats fight to a stalemate, and the battle of the chaff raged on! 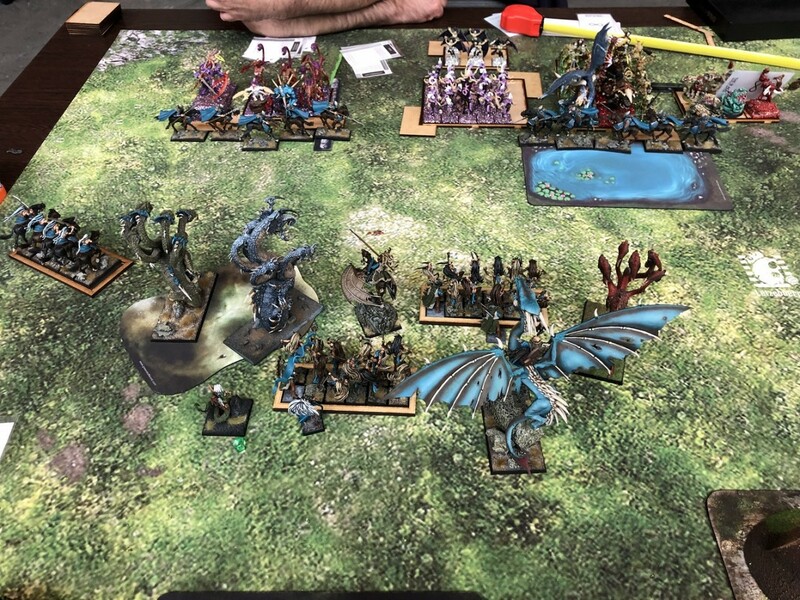 It has been too long, but the 2019 tournament season has started at last! 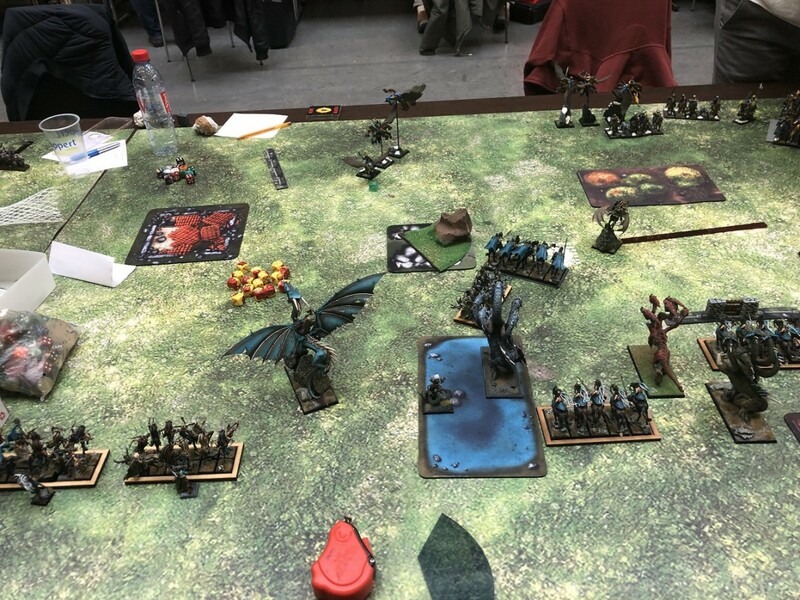 For yours truly and the rest of the team Belgium our first stop was to be the Myreille Strategic Team tournament in nearby Lille, France. 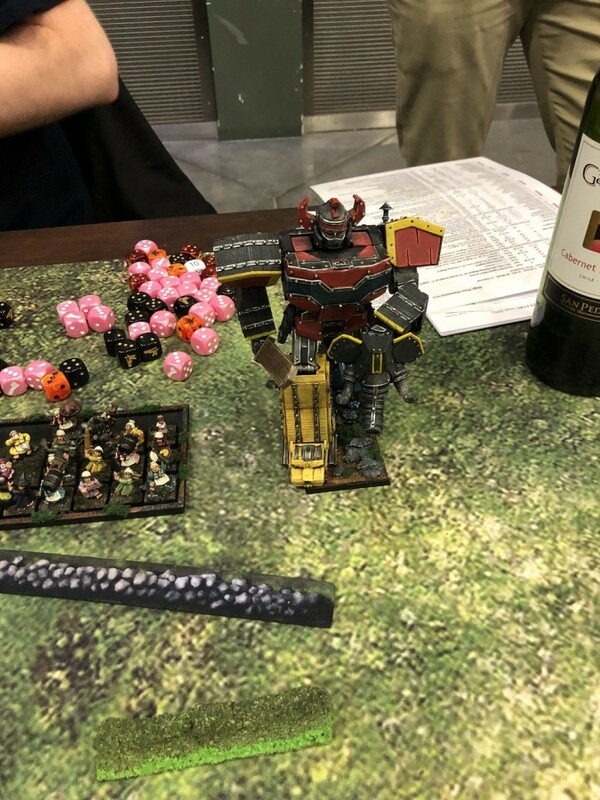 Those of you who have followed this blog in the past few years will remember that name,since it is a tournament that we’ve been attending since its conception in2017. Tanguy ( @Tartignolle ) is the main driving force of the event, and he never fails to deliver a very enjoyable weekend: an array of great opponents from the north of France, Belgium and Luxembourg, getting together to share quality beer, local food -and local liquor- in the backdrop of competitive games of T9A! 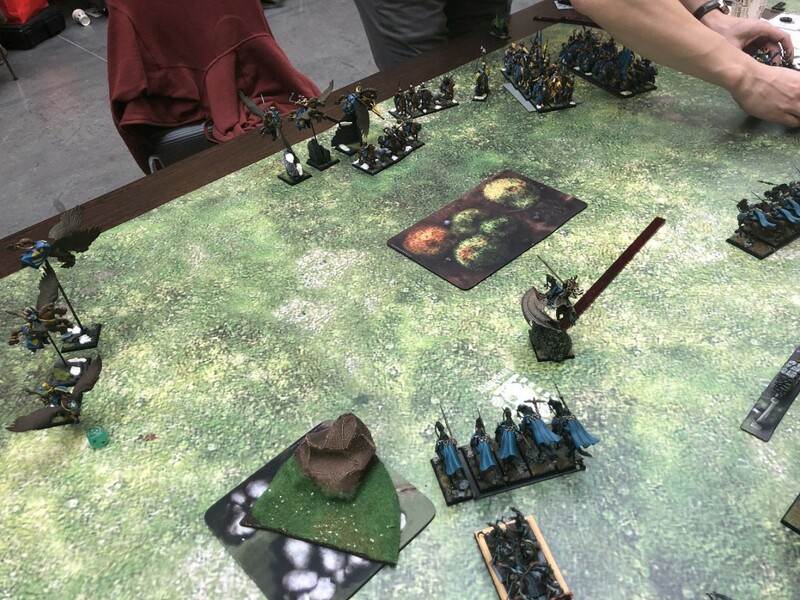 This year the event was bigger than ever: a total of 14 teams of 4 players managed to make it, with another 6 in a waiting list! This is not surprising, given the quality of the event and the hospitality of our friends from Lille. 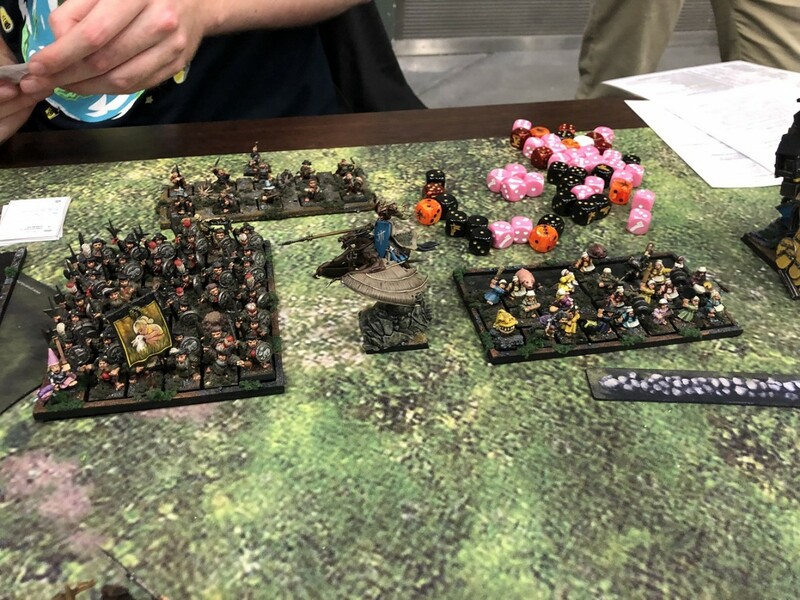 Our team comprised of @gregor with his Daemonic Legions, @PrinceCharming with his Ogre Khans, the Undying Dynasties of @IHDarklord and, finally, my Tolkein-themed Sylvan Elves. Why the mention of dear old J.R.R. , you ask? Well, because I was looking for an excuse to bring as many Forest Eagles as possible and “the Eagles are coming!” was the best catchphrase I could think of! So overall a good mix of close combat power and maneuverability, with a splash of shooting and magic to keep my opponents relatively honest. One of my goals was to test whether the SE without Forest Spirits are as vulnerable to magic and autohits as the internet makes them out to be. 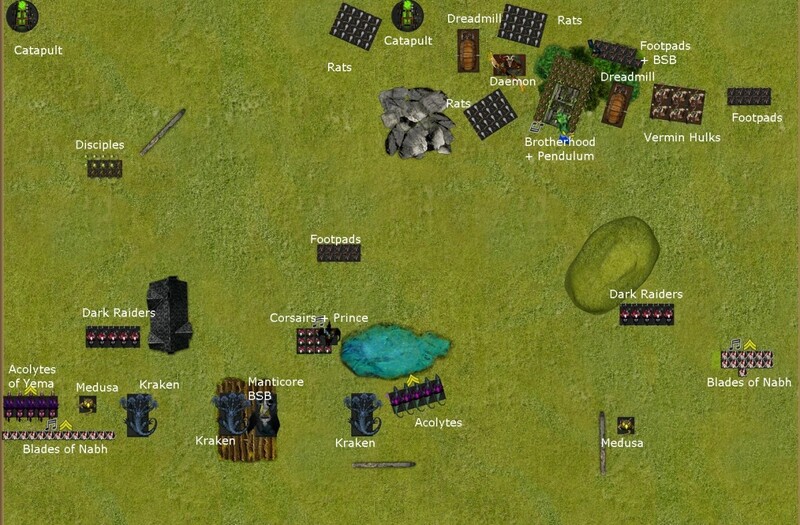 The tournament field contained all kinds of lists, with all of the 16 armies being represented: about half of the lists had at least a Pyromancy or a Divination master, with a handful bringing other magic missile-heavy paths such as Thaumaturgy. In my quest to prove that Sylvans can face such opposition, the forest Eagles were my secret weapon. 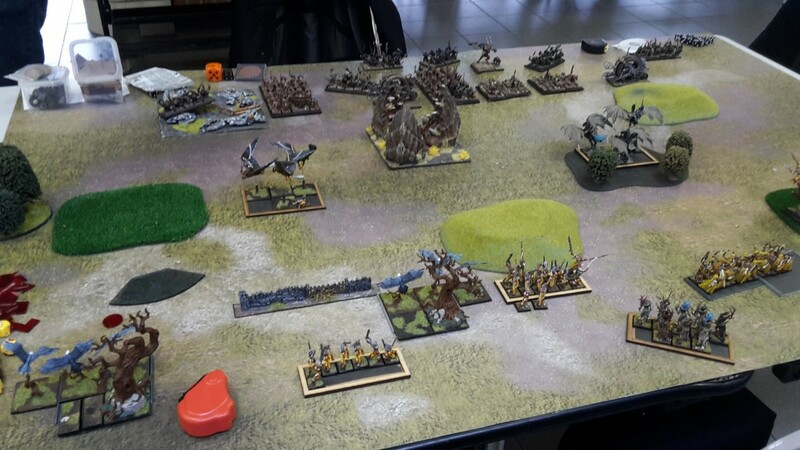 So a rather aggressive dwarven list, not unlike the one that I played last year.With four potential vanguards, it could pose some problems to the more static parts of my army. 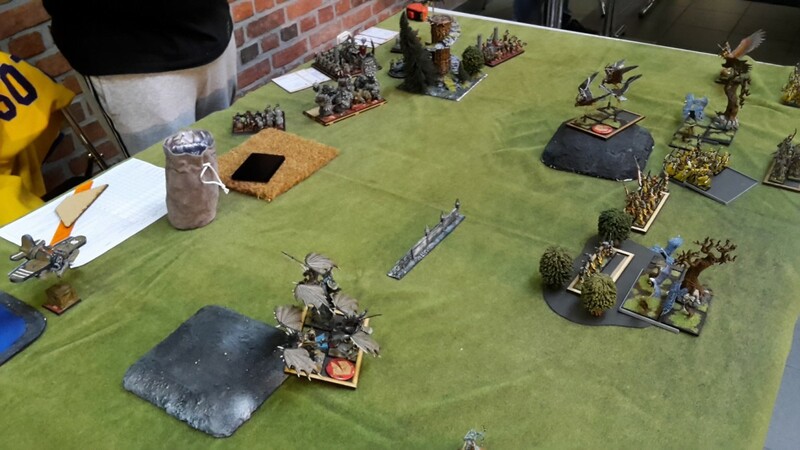 The scenario we got was Capture the Flags, and deployment was Frontline Clash. 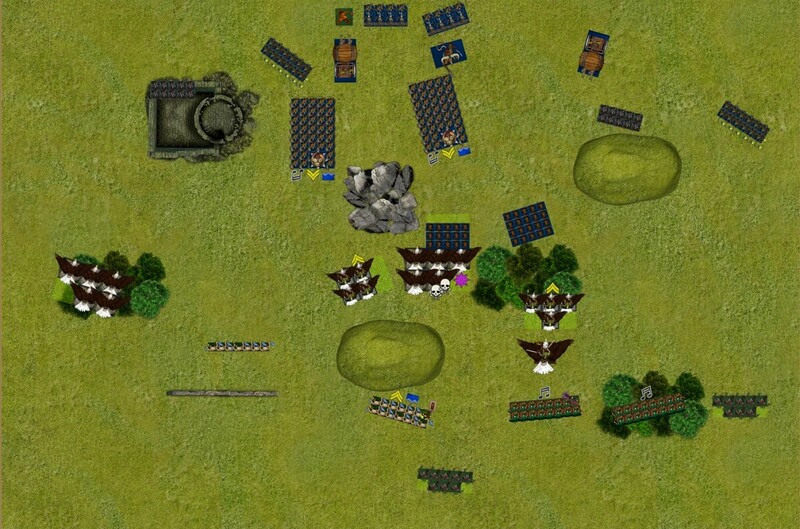 After a couple of drops (gyrocopters) my adversary went for a full drop, and to my surprise he decided to castle in one of the corners, using a piece of impassable terrain to hide his Anvil. 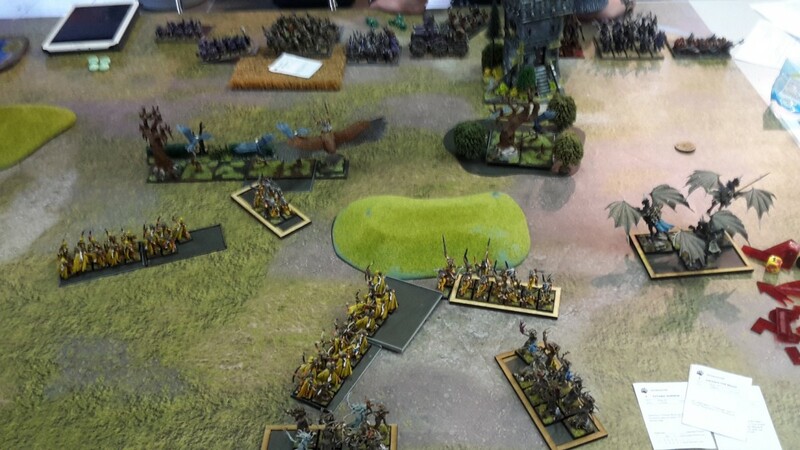 In response, I put my dryads far away from danger, both units of Archers right across the Seekers and loaded up the middle with the Dancers, kestrels and Eagles. 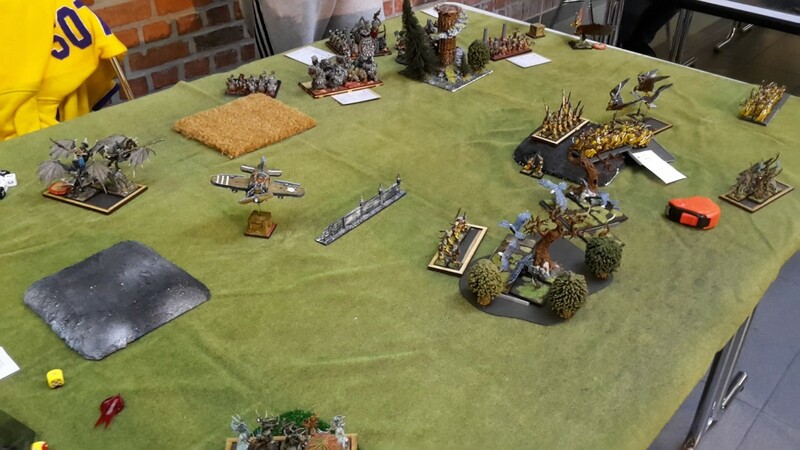 The dwarves inched forward cautiously, getting in range for shooting with the gyrocopters; these failed to hit my kestrels thanks to the Hard Target rule. Magic saw the Seekers get the rune of Gleaming cast on them. 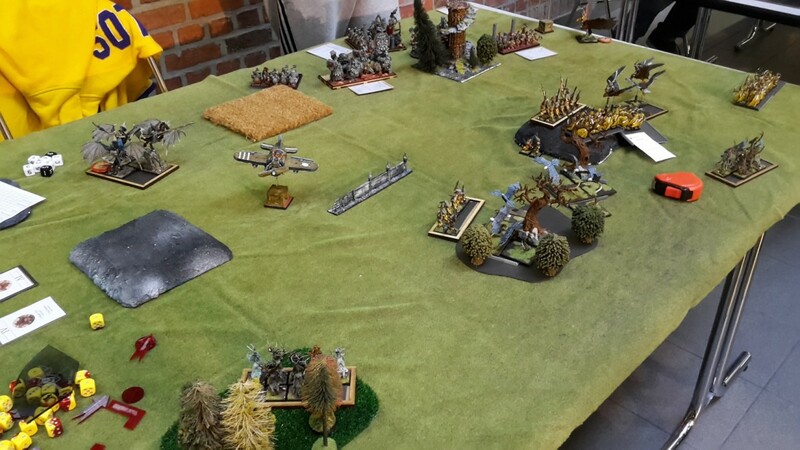 The sylvans were a bit more aggressive: they spotted the flank of the left gyrocopter and declared charges on it, but failed to connect. 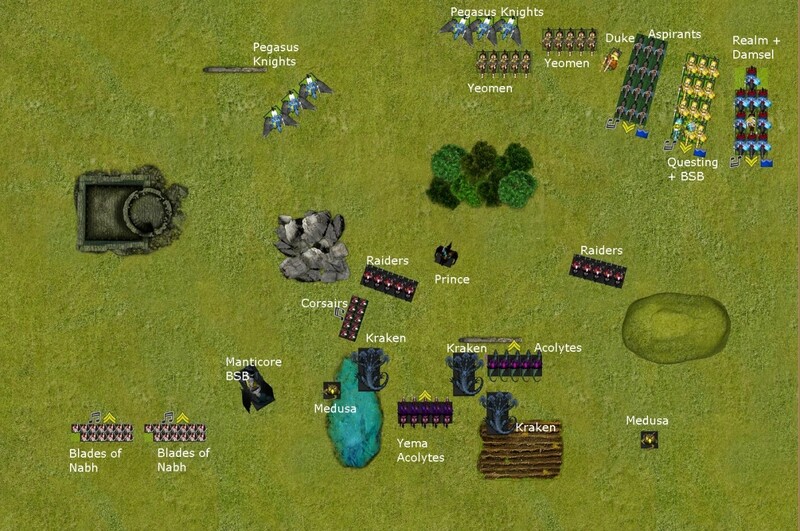 The middle force moved up to threaten the dwarven advance, careful to stay outside of the charge range of the seekers. 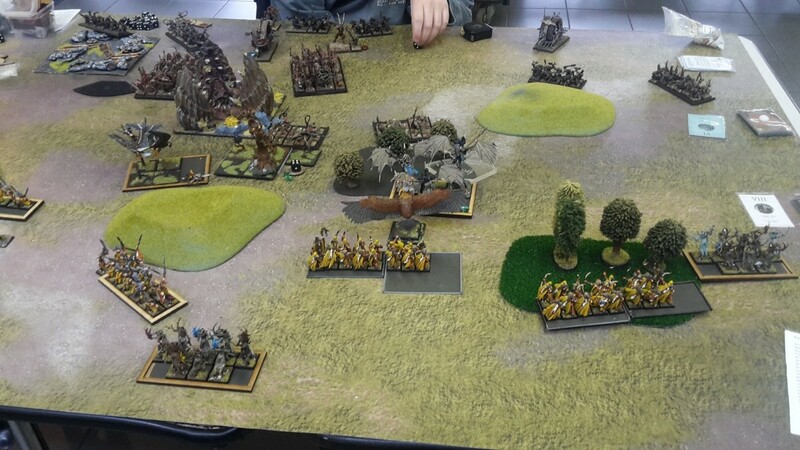 The Eagle King moved aggressively past the unbreakable dwarves, with several charge possibilities for the following turn. 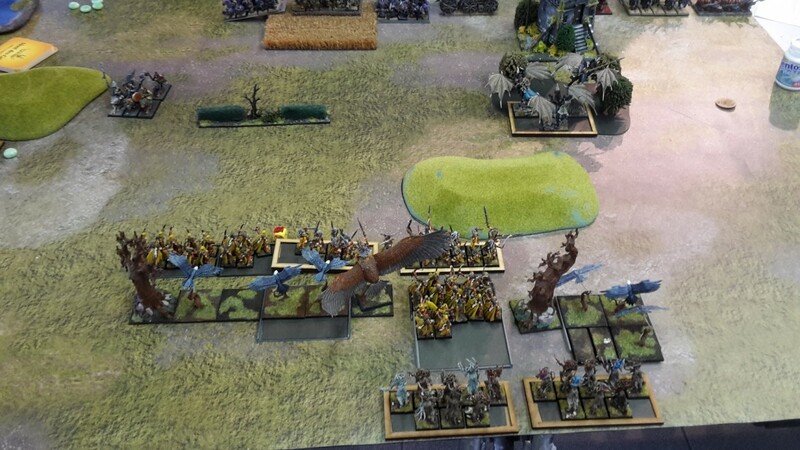 In the magic phase I was able to cast a Totemic Summon, and the Totemic Beast appeared right behind the dwarven lines. 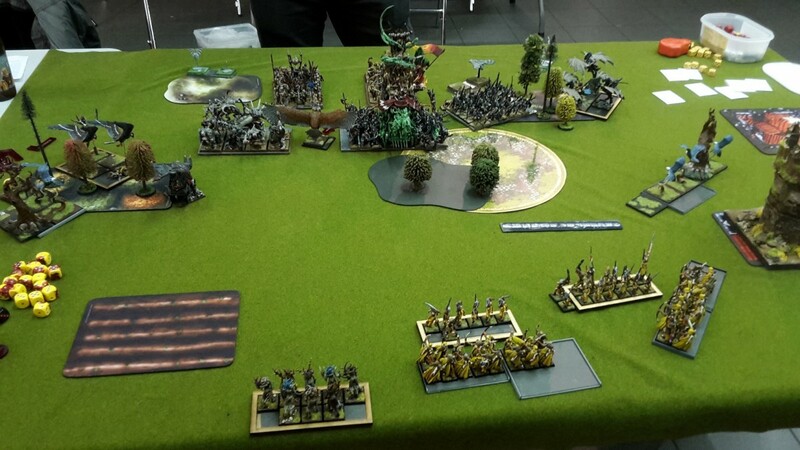 Its breath weapon caused two wounds to the vengeance seeker,while the archers dealt a couple of wounds to the seekers.